The supplier does not allow discounts on this item, but receive $2.45 in reward cash to use on any future purchase. worth $2.45 in future purchase credits. NUMBERED is basically, A Card At Any Number (ACAAN) effect, but on steroids! In similar effects, the card is at the place chosen by the spectator. 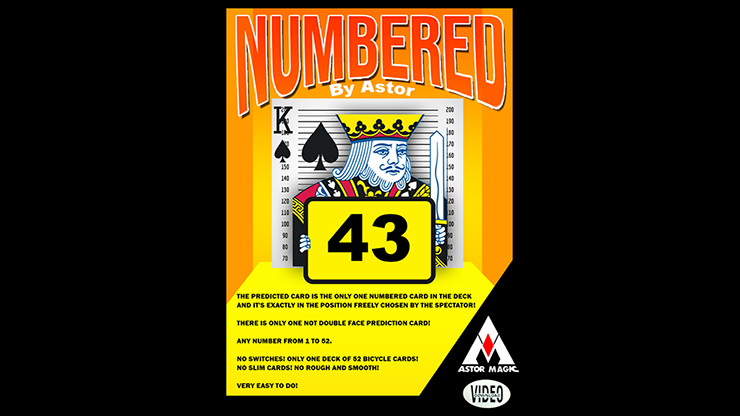 However, in this version the predicted card is not only in the position freely chosen by the spectator, but it also has a number printed on it - the exact number the spectator chose! And, it is shown to be the only numbered card in the deck! With this effect, you receive an App can be stopped at any number from 1 to 52!